The Star Wars saga has been nipped and tucked at for years by its maker, but to fans, the words “Special Editions” are uttered like venom—a perversion of iconic films. But with recent rumors of plans to finally release the theatrical cuts, we thought we’d take a look back at what Lucas changed, and how some of these changes actually made Star Wars better. “A movie is never finished, only abandoned”—that’s the quote (liberally adapted from Leonardo da Vinci) that drove George Lucas in 1997 to spend just as much money remastering Star Wars: A New Hope as he did filming it 20 years prior. It’s something that the filmmaker had been doing to Star Wars since 1981, all the way up to the 2011 Blu-Ray releases. While it’s easy (far too easy) to point out many egregious edits that have given Lucas and the Special Editions such a foul reputation among diehard Star Wars fans—Greedo infamously shooting before Han did, inserting Hayden Christensen as Anakin Skywalker’s Force ghost over Sebastian Shaw, the list goes on and on and on—among the vitriol it’s easy to forget that some of the changes made to A New Hope, The Empire Strikes Back and Return of the Jedi aided, rather than maligned, the Star Wars saga. It would not be an unpopular opinion to say that Darth Vader is the best, most iconic science fiction villains of all time. There’s many factors that make him such a remarkable and memorable bad guy, but the one that stands above all is the fantastic vocal performance James Earl Jones provided for the character. Vader’s voice is embedded in the hearts and minds of millions, the cadence of every quote, the mechanical breathing, the booming presence. But originally, Jones wasn’t included in the credits for the films. So when it came to Darth Vader, I said, no I’m just special effects. But it became so identified that by the third one, I thought, OK I’ve been denying it, I’ve been saying it sounds like the (7-Up soft drink) Uncola nut guy Holder. Geoffrey Holder! ... and I got away with it. Jones eventually relinquished the idea that somehow his voice played no major part in turning Vader into one of the most formidable villains of all time, but it wasn’t until the 1997 Special Editions that he was officially credited as the voice of Darth Vader. Minor in the grand scheme of the changes made to the films, and with no impact on the stories themselves, but still an important change: recognition of one of the most famous vocal performances in movie history. When Empire Strikes Back released, Ian McDiarmid had yet to be cast as Emperor Palpatine, and make-up for the character was far from being designed. So when Vader communicates to his master about the potential to turn Luke Skywalker to the Dark Side, the figure we see (played by Elaine Baker, wife of make-up artist Rick Baker, and voiced by Clive Revill) looks radically different to the Emperor of Return of the Jedi... and honestly, it’s not the best prosthetic work in the first place, and it definitely doesn’t hold up today. So during principal photography for Revenge of the Sith, McDiarmid was asked to reshoot the scene to provide visual continuity—and while his makeup for Palpatine in the prequels was a bit different than his original Jedi appearance, it looks a lot better than the original, and makes a lot more sense to see McDiarmid’s Palpatine communing with Vader. On the downside, the dialogue changes made in the scene to obliquely reference Anakin Skywalker are a bit less defensible. In the original cut of A New Hope, Biggs Darklighter, Luke’s best-friend-turned-Rebel-pilot, is barely seen. He makes a minor appearance during the Battle of Yavin sequence before his death, and yet it’s meant to be treated as something tragic—two close friends briefly united before being cruelly torn apart in battle. It doesn’t exactly work when the first time we actually see Biggs is during the actual battle, outside of a few mentions by Luke earlier in the movie. The Special Edition added back in a cut scene of Luke and Biggs’ reunion, and its presence at least gives us a sense of their relationship before Darklighter’s untimely death, adds a bit more humanity to the tragedy rather than “oh right, that guy.” It makes Biggs’ death sting a little more, another ratchet of tension to the battle across the Death Star. Although Biggs’ other deleted scene has never made it back into the films, perhaps for good reasons, it was nice to actually see a bit more of the friend that meant so much to Luke. I know your pitchforks are already raised in anger at the mere thought of me defending the Special Editions in the first place, but don’t raise them higher just yet: I’m not about to defend the removal of the original (and much better) band song “Lapti Nek,” which is outstandingly funky, in favor of “Jedi Rocks,” a far inferior song that feels out of place with the soundscape of the original movies. I am, however, going to actually defend the additions made in regards to poor slave dancer Oola’s death-by-Rancor in the scene, because it does a much better job in terms of teasing a monster than other changes made for the Special Editions. One of the few changes made to Empire Strikes Back was to show a lot more of the Wampa in the scene where Luke escapes its cave. But in showing off that the new monster, much of the tension of the moment is lost entirely: in the original cut, the Wampa is heavily obscured and barely seen (mainly because Lucas was not pleased with its appearance). It allowed the audience to fill in the fear with their imagination, aided only by roars and snarls and the briefest of snippets. In the Special Edition version, we laboriously see the Wampa chomp away at Luke’s Tauntaun, the fear and tension gone altogether. In the original Return of the Jedi cut, all we hear of Oola’s death is her scream from above while Jabba and his cohorts look on. The Special Edition shows a little bit more as she tumbles into the Rancor pit—but unlike the changes to the Wampa cave scene in Empire, it’s shot in such a way to obscure the Rancor: you see Oola look up at the bloodthirsty crowd, the briefest shot of the pit door raising, her look of absolute terror, and then cut to the scream. It keeps the grand reveal for Luke’s fight against the creature, but it sets your imagination alight. It’s bizarre that the Wampa was handled so differently, as so much worse, in comparison. Also, fun fact: Femi Taylor, who originally played Oola in Return of the Jedi, reprised the role 15 years later for the additional footage, wearing the same outfit she wore in 1982. There’s barely a difference in her appearance between the old and new sequences: producers were shocked that Taylor’s impressive dancing career had kept her from visually aging all that much in a decade and a half. The practical model work in the original Star Wars films was like nothing anyone had seen at the time, an industry-defining evolution of effects work. But if you go back the original sequence of X-Wings dueling with TIE Fighters, the scenes might not be quite as visually arresting as you remember, or even as arresting as the battles on Hoth and Endor. Sparingly and with much faith to the original shots used in the film, CGI recreations of the original model sequences were made, but the fighters moved a little speedier, twisted and turned a little tighter. There was something slow and graceful about the original shots, but they didn’t quite match up with the intensity of the scene (or even the targeting computer shots we’re constantly shown, where X-Wing and TIE graphics vividly sweep and swing in and out of firing range). The CGI versions at least match up a little more in terms of intensity, while staying faithful to the shots and action shown in the theatrical cut. And the thing is, the changes made aren’t even just for the sake of the fact they could be done in CGI: it was to bring A New Hope up to the standard of its sequels. 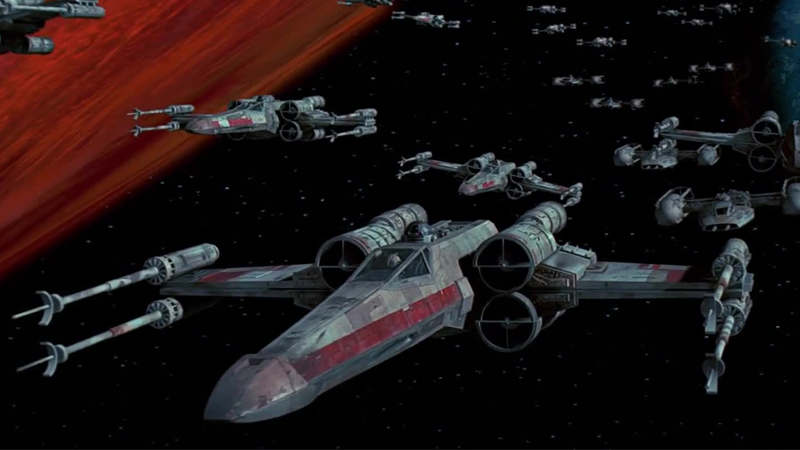 Outside of minor cleanups of matte boxes where green and blue screen work was noticeable, the much more intricate spaceship action scenes in Empire and Jedi were barely touched in the Special Editions, a testament to the incredible quality of the model work done by ILM with the advances in technology at the time. Would it have been nice to see them done with models rather than CG? Sure. But at least the CG was used to recapture the intended spirit of the original scene, not just done for the sake it being the hot new technology. Star Wars is meant to be a sweeping, epic sci-fi saga about a galaxy in peril, but in the original cuts, our view of that galaxy was surprisingly insular and small-scale. Outside of the grandiose battle sequences, we largely stick to a small group of characters, and barely get to see any of the people of the Star Wars universe in the background. The Special Editions made a few changes that improved that, and it helps sell the scope of the saga a little more. The original entrance to Mos Eisley is given a huge panning shot to show the massive scope of the town (what was meant to be a small spaceport in the grand scheme of things) that we otherwise never saw much of beyond the confines of the Cantina and the Falcon’s docking bay. Cloud City gets an equally sweeping panning shot when the Falcon arrives, and windows depicting the hustle and bustle of the city outside are added (rectifying Director Irvin Kershner’s original complaint about the set being too insular and closed off). When Lando addresses the people of Cloud City to begin evacuation, originally we didn’t see anyone: in the Special Editions you get to see the crowds milling around, and it makes it seem much more alive in the process. It’s further improved by the addition of the celebratory scenes on Tatooine, Cloud City, and Coruscant at the end of Return of the Jedi (although the 2004 addition of Naboo to that montage jars, solely because it looks out of place aesthetically—Theed hasn’t changed at all in the nearly four decades between Phantom Menace and Jedi). These shots help to emphasize the grand scale of what the Rebels were actually fighting for, that there’s this whole galaxy of billions and billions of people out there. It is the “larger world” Obi-Wan tells Luke about, and while the panning shots aren’t exactly the most drastic addition to the films, they do help an awful lot in fleshing out the galaxy far, far away a bit more. There are many—many—more changes that have been made to the Star Wars films over the years than the ones mentioned above. Among the controversy, was there anything else you thought benefited from the changes? Lets us know in the comments below.